From left to right, bikers for Baker College, the Graduate Student Association and Martel College enter the main straightaway of the 2017 Beer Bike men's race. "Our argument is that this picture shows the GSA about to finish the race, [me] about to finish my second lap and begin my last lap, and Baker's anchor about to finish his first lap -- meaning at this point he had two laps to go," Colin Losey, Martel's biker, said. "Based on this picture, we believe the initial results, which showed us two minutes and 35 seconds behind the GSA — before penalties — could not be accurate and must have included my fourth 'victory' lap." Campuswide Beer Bike coordinators Erica Zhong and Joyce Moon are working on implementing a stricter safety certification process for this year’s race. They said they decided not to implement any of the proposed changes to the tradition this year after colleges’ votes were counted amid debate and an abstention from the Graduate Student Association. According to Zhong, the coordinators are working with Rice University Cycling & Triathlon Club and other experienced bikers to develop a more stringent safety certification process. “The tasks performed during certification will be more thorough, and stricter as we will have experienced riders evaluating bikers,” Zhong, a Will Rice College sophomore, said. The campuswide Beer Bike coordinators were gathering feedback regarding a proposal to decrease the size of the teams and move the start time of the races earlier. 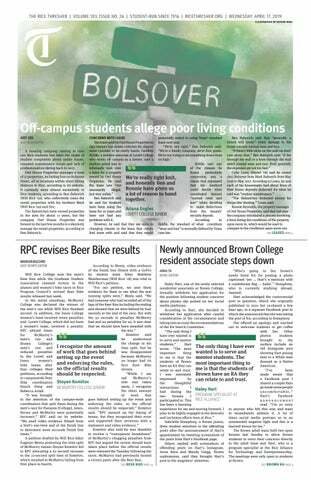 Zhong and Moon announced their decision not to implement the proposals in an email to college Beer Bike coordinators and captains. “The process by which we approached these proposals was not adequate enough to bring about such drastic changes at a time so close to Beer Bike,” Zhong and Moon said. The vote was nonbinding and the campuswide coordinators said they will use the results to create a more extensive process of considering potential changes. According to Zhong, they are still working out the details, but the change in safety certification would occur before this semester’s Beer Bike while other changes would be developed afterwards. All 11 colleges voted no on the proposal to move the race to 8 a.m., while six colleges voted yes and five voted no on the proposal to decrease the bike teams to six people. GSA President Sydney Gibson announced GSA’s abstention in both votes in a letter, which also stated the GSA’s opposition to both proposed measures. Martel College bike captain Colin Losey said he supported the bike team size reduction proposal. Gibson wrote that graduate student leaders were not fully included in conversations leading up to the vote. The letter argued the vote, which gave the GSA the same vote as one college, did not adequately convey the voice of graduate students, who make up 43 percent of the Rice population. Gibson’s letter said that the proposed changes would be detrimental to the tradition and fail to address safety concerns. According to Gibson, moving the time to 8 a.m. would greatly decrease attendance and require GSA volunteers, who all live off campus, to arrive by 4:30 a.m.
“An 8 a.m. start time so that undergraduates are less tired from drinking is inconsiderate to graduate students and to the alumni who make significant efforts to come back to campus for Beer Bike each year,” Gibson wrote. The letter said all riders should finish a stringent training and certification process in order to better address inexperienced bikers. Bike captain Katie Lobodzinski said Will Rice voted against the size reduction and that safety measures must come from training.